For a long time on this blog, there have been very few pictures. The reason for this glaring omission can be summed up in one word. There. I said it. Up until now, I have been embarrassed of the decor and colors of my house. I know I’m not the only woman out there in the traditional foods world with an ugly kitchen and living space. So I’ve decided to post about it anyway and *gasp* go ahead and do a video series in my ugly kitchen, with atrocious 80’s peeling wallpaper and all. Because it’s real life. Because my kitchen and my home aren’t perfect. Because I don’t have a limitless budget to get the best of everything. And I bet for the vast majority of you don’t, either. So I refuse to rent space or borrow the kitchen of a friend’s expensive and perfect house to make my life look like something it isn’t. I believe that’s part of the reason why so many people think they can’t do traditional foods. Their kitchen isn’t roomy enough, they don’t have enough space, the right equipment, the right whatever. Do what you can with what you have, where you are. Even in your ugly kitchen with 1980’s wallpaper. Even in your galley kitchen the size of a bathroom. Even when you’re traveling, the kids are sick, the budget is tight. Eliminate your excuses, accept your reality and do the best you can with what you’ve been handed. I am saying goodbye to my house and hello to a home. A home that isn’t perfect, but a home that is lived in. And a home that I’m trying to change, a little at a time. We’re attempting to re-do this 1980’s house in non-toxic ways, including a major overhaul on a shoestring budget for the living room, dining room, bathrooms, master bath, boys room and kitchen. Basically, every room in the house except my daughter’s room, which was re-done as a Christmas gift. I’m keeping the hardwood floors, but everything else needs to be updated. Here’s the ugly truth: our split-level house was built in the 80’s. While the house does have lots of room, a wonderful amount kitchen counter space, a good floorplan and gorgeous hardwood floors, every room in the house is painted in a different, 1980s color. My bedroom is drab salmon orange. As someone who is a porcelain winter, prefers cool colors and has a love affair with purple, sleeping in that room is responsible for more than one nightmare. Another bedroom can only be described as having a wall color that looks like the sun threw up. So bright you can see it smiling with your eyes closed. Yet another room is lavender with neon purple trim and the world’s gaudiest lighting- it’s a former hair salon. The living room, thankfully, is off-white. However, the brown and orange, ungrouted floor to ceiling fireplace with oversized chair railing more than I can bear. Then there’s the kitchen. It’s dark with very poor lighting. It’s a country hearts nightmare, complete with the original wallpaper, dark cabinets, an even darker tile floor and little country-blue-house-and-washed-out-red-hearts porcelain cabinet pulls. 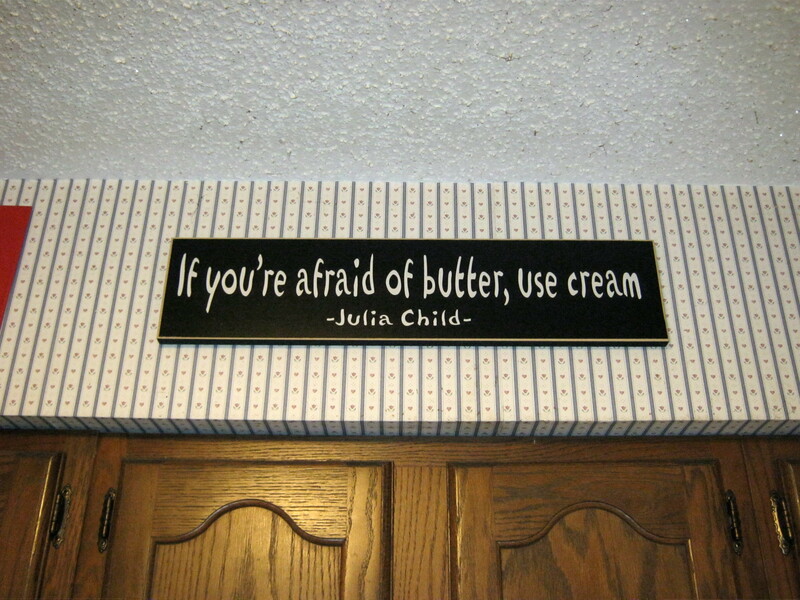 Remember the Julia Child sign I blogged about a while back? Black and white “If you’re afraid of butter, use cream” goodness? I was in love. So in love. So much, in fact, that I bought two. I haven’t posted a picture of it because it is surrounded in a country blue nightmare. I’ve been too embarrassed. Nope, not any better. 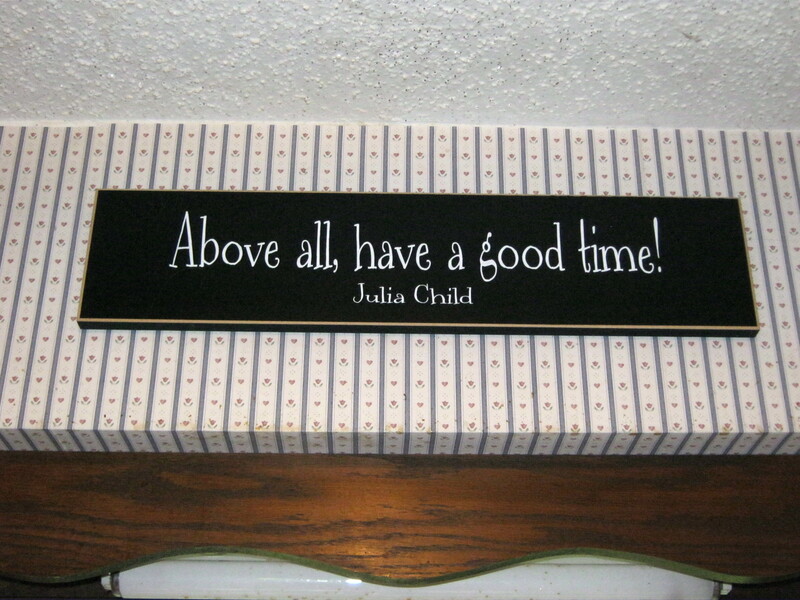 And I hate the popcorn ceilings. The little red sign to the left is a children’s church craft, in case you’re wondering. We’ve purchased the paint to re-paint the living room, dining room and kitchen. Now we’re trying to find the time and everything else needed. Then we need to re-do the cabinet and countertops, re-tile the kitchen floor, paint the bedrooms, rip out the bathroom and re-do it and the list goes on and on. Meanwhile, I’m doing crafts and other decorating in an attempt to fill in the gaps until the bigger work gets done. I hope you will enjoy this journey with me. I’ll blog little bits and plenty of pictures of the renovations and the crafts and other homemaking I’m doing as we find the time to research, purchase and do the work. Wow, you and I are in very nearly the same boat, Kerry Ann. I am the official new owner of my house, all 1700 sf of it. My home was built in 1983 and nearly nothing has been changed since then. In the kitchen there are pretty awesome black updated appliances, so that’s good. The kitchen has that washed out looking paint job that was popular way back when, except for the part that the former owner’s dog chewed off–about 2 ft. The floors are dark grey faux marble tiles. The drapes are blue with little ugly little gold flowers all over, and said dog apparently also chewed on the drapes. No carpet anywhere but all the bedrooms. Ugly yellow and grey floor to ceiling fireplace…do we live in the same neighborhood? Foundation problem to be repaired next week to the tune of 5 grand. Then we will begin repairing the fist and head holes in the sheetrock–the last owner had a temper, I’m told. After that, we paint and install flooring. I found an online company that sells paint kits that modernize and make any ugly old fireplace look amazing. Next we will rip out the old 80s wallpaper and vanity in my bathroom. I already bought all the pretty things to go in there, and I can’t wait to see it when it is done. I’ve found some astounding bargains on Craig’s List and other places. I hope my money holds out. In the meantime, I am also seeking to have a home that feels warm and inviting. Saaaame boat! But, I boarded mine differently. My 28 yo hubby owned his own home when we married- in all it’s bachelor chic! I have had to make peace with the “deal” furniture were nothing matches & things were set up for video games and microwave cooking. To his credit my hubby replaced his worn out washer/dryer and stove before the wedding. I was on a tight rope because we had the standard newlywed budget & I didn’t want to start my marriage telling my hubby his home now wasn’t good enough for me! We’ve just upgraded items over the last 4 years, trying to steer our purchases towards a central theme- in our case the beautiful sage green in our den. Other than that I keep it light wood & beige coloring- it’s more clean & fresh than boring like it sounds. I go for a few plants, candles, and love photos & tin signs. Later another house was added on that had been moved from a nearby ranch. It contains a large room which is to become our maser bedroom; a smaller room which will become our sitting room/studio; and a nice bathroom with an original claw foot bathtub. It appears that the bathroom is to become my new sewing room and then we adding another small room that will be the new bathroom. This part of the house and the adobe are joined by an \L\ shaped screened porch. On the other side of the adobe house are another couple of rooms that came from an old hotel from a small town nearby. They contain the kitchen and a dining room. We have removed the wall between those two to make one large kitchen/dining area. All of this sounds very cool doesn’t it? In the mid-70’s his grandparents retired out there and that meant ugly carpet and paneling almost everywhere that was not adobe! Thank goodness they didn’t change that! When we pulled up the avocado green 🙁 carpet in the new master bedroom we discovered beautiful, original long pine floors. On a distressing note, at some point they tore up the other wood floors and poured a concrete floor throughout the rest of the house. Oh well, at least one piece of the original floor is still intact. Of course that 70’s wood paneling had to go! LOL Our contractor has reframed everything so that insulation could be added to the walls; before they were just plain wood walls protecting the house from the elements. Then he will put up sheet rock where the paneling was and that will brighten up the house immensely. We are going to do the kitchen/dining room walls in bead board to keep the flavor of an old house. The other part of the house has bead board ceilings that are 11 feet high. The ceiling in the new kitchen/dining area will be slightly vaulted, insulated and finished with sheet rock. We have not decided on the floors yet but we are leaning toward a light colored rustic looking tile for the kitchen & the bathrooms. Right now those have ugly vinyl tile in them. The adobe bedroom & living room will probably wind up with a wood or wood-look floor and scatter rugs. We are having the whole house rewired since that has not had any serious updating since it was put in several decades ago. Much of the plumbing will also need updating. Well that is my current life and while I am somewhat concerned about our eventual state of finances, I am also having a ball planning my new/old house. I hope you all enjoy your remodeling projects too. There are definitely hassles but when you can see it coming together it makes it all worthwhile! Rock on with your honest self! I live in an 80’s house, too. Dark brown countertop and cabinents. Popcorn ceiling WITH GLITTER!! Dark linoleum floors. Retired husband, no money. Being thankful for what I have.